This year the members of the Aboriginal Students Association (ASA) at OCAD are participating in Buffalo Jump 2008 and would like to extend an an invitation to the rest of the OCAD community to join us. This is a great opportunity to show our support on behalf of OCAD and this will give everyone the chance to engage in traditional First Nations' activities such as dancing, prayer and celebration. We live in such a multicultural city and are part of a very multicultural academic environment, and this day is a great day to be more aware of this fact. Although this is a day to celebrate First Nations culture, the main reason for this festival has always been to unite ALL people. With this in mind we hope to see as many people from the OCAD community there, and more information will come as the date approaches. National Aboriginal Day is celebrated every June 21. The Cultural Walk starts at City Hall, and ends in Trinity Bellwoods Park. (Toronto—June 14, 2010) OCAD University’s Aboriginal Visual Culture Program celebrates National Aboriginal Day with the launch of the exhibitions Passages: First Peoples at OCAD at the University, and Endaian at the McMichael Canadian Collection. The University will also hold Portage: A symposium on Aboriginal Visual Culture with guests Duke Redbird, Robert Houle and Susan Dion. Passages: First Peoples at OCAD is presented in On Site at OCAD, and showcases the work of OCAD’s Indigenous alumni, faculty, students and staff. An opening ceremony and reception will take place in the Great Hall on National Aboriginal Day, Monday, June 21, from 7:30 to 9:30 p.m. The exhibition continues until July 2. On June 22 from 2 to 4:30 p.m., Portage: A symposium on Aboriginal Visual Culture offers guests an opportunity to hear the first-hand accounts of artists and scholars who contributed to the reawakening of Aboriginal people and their culture in Canada. Portage speakers’ stories extend from the 1960s to the present and recount, from their unique perspectives, the key events in recent Aboriginal history — events that contributed to the emergence of a vibrant Aboriginal presence in the contemporary cultural scene. Speakers are Duke Redbird, poet, artist, actor, educator; Robert Houle, artist, curator, writer, educator; and Susan Dion, writer, educator. Portage takes place in the OCAD University Auditorium. The exhibition Endaian (or “home” in Ojibwa) runs from June 19 to September 6, with an opening reception on Tuesday, June 22 from 7:30 to 9:30 p.m. The exhibit includes work by OCAD Aboriginal students Violet Chum, Erika A. Iserhoff, Meryl McMaster, Antoine Mountain and Lisa Myers, all of whom are responding to the work of the Group of Seven. To learn more about OCAD’s Aboriginal Visual Culture Program, visit www.ocad.ca. During the sixties and seventies Duke Redbird was in the forefront of Aboriginal political organizations and was a prominent public speaker on Native issues, providing First Nations people in Canada with new, young and aggressive leadership. He was president of the Ontario Métis and Non-status Indian Association and director of their land claims research, as well as vice-president of the Native Council of Canada. A prominent broadcaster and poet, Duke has appeared in numerous film and video productions and spoken on Native issues both nationally and internationally. Duke Redbird received his M.A. in interdisciplinary studies at York University, Toronto in 1978. He currently serves as mentor/advisor in the Aboriginal Visual Culture Program at OCAD University. Robert Houle has exhibited his work internationally since the 1970s, at the Museum of Contemporary Art (Sydney), the Canadian Cultural Centre (Paris), the Stedelijk Museum (Amsterdam), and many others. In Canada, he has shown work at the National Gallery, the Art Gallery of Ontario, the Winnipeg Art Gallery, the Museum of Contemporary Canadian Art, Carleton University Art Gallery, and many more. His work is included in most major Canadian collections. Houle was the first Aboriginal curator of Indian Art at the National Museum of Man (now the Museum of Civilization) in Ottawa from 1977 to 1980 and co-curated the landmark exhibition Land, Spirit, Power at the National Gallery of Canada in 1992. Houle was the first Aboriginal faculty member at OCAD University, a position he held for fifteen years until 2005. 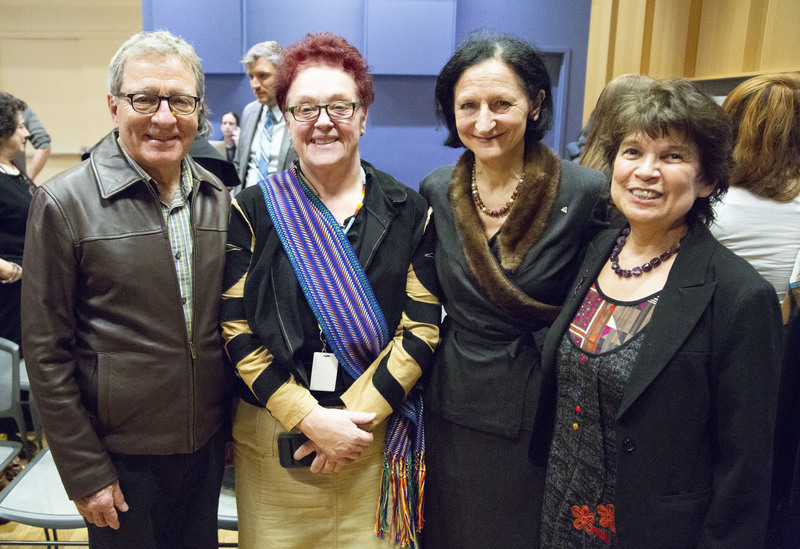 Susan Dion is an Aboriginal scholar who has been working in the field of education for 25 years. Her teaching and research focuses on understanding the relationship between Aboriginal and non-Aboriginal people in Canada. Dion’s research interests include the social and political contexts of education; disrupting memories of post-invasion First Nations - Canadian Relations; resistance strategies of Aboriginal adolescent girls; Aboriginal Women and the policy of forced assimilation and violence prevention in Aboriginal communities. Dion’s recently published book Braiding Histories: Learning from Aboriginal Peoples' Experiences and Perspectives proposes a new pedagogy for addressing Aboriginal subject material, shifting the focus from an essentializing or "othering" exploration of the attributes of Aboriginal peoples to a focus on historical experiences that inform our understanding of contemporary relationships between Aboriginal and non-Aboriginal peoples. Dr. Dion is a professor in the Faculty of Education at York University. OCAD University (www.ocad.ca) is Canada’s “University of the Imagination.” The University is dedicated to art and design education, practice and research and to knowledge and invention across a wide range of disciplines. OCAD University is building on its traditional, studio-based strengths, adding new approaches to learning that champion cross-disciplinary practice, collaboration and the integration of emerging technologies. In the Age of Imagination, OCAD University community members will be uniquely qualified to act as catalysts for the next advances in culture, technology and quality of life for all Canadians. (Toronto—October 11, 2012) Students considering a Bachelor of Fine Arts degree have a new option available to them through OCAD University in Toronto. With enrolment starting in fall 2013, the institution now offers an interdisciplinary degree in Aboriginal Visual Culture that combines contemporary Aboriginal aesthetic and social studies with a comprehensive studio-based art education. "Our new degree program is a major milestone among a series of initiatives we have developed over the last several years that address Indigenous culture and context at OCAD U," said Bonnie Devine, Founding Chair of OCAD U's Aboriginal Visual Culture Program. "Our work has involved creating an Aboriginal student centre and support services, as well as building our curriculum, including a minor." Combining practice-specific and interdisciplinary studio courses in the Faculty of Art and the Faculty of Design with concentrations from the Faculty of Liberal Arts & Sciences in the visual, cultural, social and political history of Aboriginal peoples, the curriculum is designed to develop students' critical, creative and practical expertise in Aboriginal cultural and artistic practices. 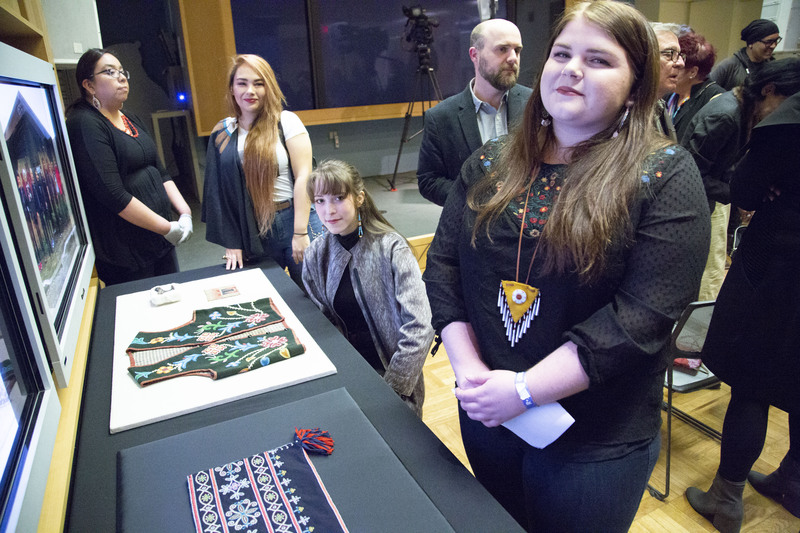 "This program is the first of its kind in Canada, especially when considering Aboriginal culture within the spectrum of art and design education," said Kathryn Shailer, Dean of OCAD U's Faculty of Liberal Arts & Sciences and School of Interdisciplinary Studies. "It gives students with an interest in Aboriginal issues and practices a degree program that allows them to develop their skills and knowledge, and will graduate students who will be thoughtful contributors to these concerns. Also new next fall will be an Augmented OCAD U First Year Program for Aboriginal Students, delivered at Laurentian University in Sudbury. "Our Aboriginal Education Council set a priority for us to develop a program where students from Ontario's north can attend a full first-year program at a location roughly midway between their home communities and OCAD U's main campus in Toronto," said Devine. "Our goal is to create an environment for success, and this program will help with the challenges students experience in transitioning to the south. We're very pleased to be working with Laurentian, an institution with a well-developed support system for Aboriginal students that is committed to their success." The new BFA in Aboriginal Visual Culture will be celebrated with a Symposium and Pow Wow on Tuesday, October 16 at OCAD University. All are invited to these free events. The symposium runs from 9 a.m. to 12 noon and the Pow Wow takes place in the afternoon, from 1 to 5 p.m. Prospective students can apply for the Aboriginal Visual Culture BFA program now through the Ontario Universities Application Centre for the 2013/14 academic year. In an effort to improve access to art and design education for students at home in north-central and northern Ontario, OCAD University has collaborated with Laurentian University to create a full first-year program that will be delivered on the Laurentian University campus in Sudbury. Although the students recruited for and admitted to this transition program will be OCAD U students, Laurentian students will also have access to the studio and visual culture that OCAD U will deliver in Sudbury. OCAD U students will have access to Laurentian's two-semester transition course for Aboriginal students. Overall, the Augmented First-Year Program will assist Aboriginal students in negotiating university-level studies and ease the transition from small northern Ontario communities to urban living, first in a midsize and then in a major urban centre.